Milton is located between the Neponset River and the Blue Hills. It is bordered by Boston's Dorchester neighborhood and Mattapan neighborhood to the north and its Hyde Park neighborhood to the west, Quincy to the east and south, Randolph to the south and Canton to the west. Milton was settled in the 1630s as a part of Dorchester by Puritans from England. Richard Callicott, one of the first settlers, built a trading post near the Neponset River and negotiated the purchase of Milton from Sachem Cutshamekin. Many of the settlers arrived during the 1650s fleeing the aftermath of Oliver Cromwell’s deposition from power and the English Civil War. Referred to as "Unquity", the term used by the Neponset Tribe of the Massachusetts Indians meaning "Lower Falls," which was translated into "Lower Mills" after the establishment of the Israel Stoughton Grist Mill in 1634. In 1662, "that part of the Town of Dorchester which is situated on the south side of the Neponset River commonly called 'Unquatiquisset' was incorporated as an independent town and named Milton in honor of Milton Abbey, Dorset, England.” Many early Puritan families of Milton became influential and important in the Massachusetts Bay Colony, such as: the Sumners, Houghtons, Hutchinsons, Stoughtons, Tuckers, Glovers and Babcocks. A powder mill established in 1674 may be the earliest in the colonies, taking advantage of the town's water power sites. Boston investors, seeing the potential of the town and its proximity to the city, provided the capital to develop 18th century Milton as an industrial site with an iron slitting mill, paper and sawmills, and the first chocolate factory in New England (the Walter Baker Chocolate Factory) in 1764, which was converted from the old Stoughton Grist Mill. Laying of streetcar lines fueled the rapid expansion of residential development. Between 1870 and 1915, Milton grew into the community it is now: a streetcar suburb with some chocolates, biscuits and market produce to remind residents of the past. By 1929, many of the big estates were broken into subdivisions as the town's residential growth continued. The Suffolk Resolves were signed in Milton in 1774, and were used as a model by the drafters of the Declaration of Independence in 1776. The Suffolk Resolves House, where the Resolves were passed, still stands and it is maintained as the headquarters of the Milton Historical Society. The house was moved to a new location at 1370 Canton Avenue in West Milton in order to save it from demolition at its previous location in "Milton Village" at Lower Mills. They were the "Suffolk Resolves" because Milton was part of Suffolk County until 1793, when Norfolk County split off, leaving only Boston and Chelsea in Suffolk County. Two royal governors of Massachusetts, Jonathan Belcher and Thomas Hutchinson, had houses in Milton. The Governor Belcher House dates from 1777, replacing the earlier home destroyed in fire in 1776, and it is privately owned on Governor Belcher Lane in East Milton. Although Hutchinson's house was demolished in the 1940s, Governor Hutchinson's Field, owned by the Trustees of Reservations today is a wide expanse of greenery on Milton Hill, with a view of the Neponset River estuary and the skyscrapers of Boston six miles (10 km) away. Both Governor Belcher's house and Governor Hutchinson's field are on the National Register of Historic Places. The town was home to America's first piano factory. Revolutionary Milton is the setting of the opening of the 1940 bestselling historical novel Oliver Wiswell by Kenneth Roberts. The Blue Hill Meteorological Observatory is located in the town, home of the nation's oldest continuously kept meteorological records. The Granite Railway passed from Quincy to the Neponset River in Milton, beginning in 1826. It is often called the first commercial railroad in the United States, as it was the first chartered railway to evolve into a common carrier without an intervening closure. A centennial historic plaque from 1926 and an original switch frog and section of track from the railway can be found in the gardens on top of the Southeast Expressway (Interstate 93) as it passes under East Milton Square. The frog had been displayed at the Chicago World's Fair in 1893. East Milton Square developed as a direct result of the Granite Railway. Four sheds there were used to dress the granite stone prior to it being brought by rail to the wharf for transfer to boats. East Milton Square was originally termed the "Railway Village" and a train station was located there after 1871 when the Granite Railway became a passenger line of the Old Colony Railroad. The Blue Bell Tavern, which was also a hotel, served as the headquarters of the Granite Railway and it was later named the Russell House. It was located on the site of the current United States Post Office in East Milton Square. In 1801 Josiah Bent began a baking operation in Milton, selling "water crackers" or biscuits made of flour and water that would not deteriorate during long sea voyages from the port of Boston. The crackling sound occurred during baking, hence the name. This is where the American term "cracker" originated. His company later sold the original hardtack crackers used by troops during the American Civil War. The company, Bent's Cookie Factory, is still located in Milton and continues to sell these items to Civil War reenactors and others. Robert Bennet Forbes was a noted China Trade merchant, sea captain, and philanthropist during the Irish Famine. He built a Greek Revival mansion in 1833 at 215 Adams Street on Milton Hill. The Captain Robert Bennet Forbes House is now listed on the National Register of Historic Places and is open for tours. In addition to artifacts from the China Trade period, the museum's grounds include a log cabin replica and a collection of Lincoln memorabilia. George Herbert Walker Bush was born at 173 Adams Street on Milton Hill on June 12, 1924. He became the 41st President of the United States, serving from 1989 to 1993, and his son would become the 43rd President. Coincidentally, Adams Street is named for the family of Presidents John Adams and John Quincy Adams, who lived on the same street just a few miles southeast in Quincy, Massachusetts. The Bush Family moved from Milton to Greenwich, Connecticut in 1925. The Victorian house where President Bush was born is now privately owned and not open to the public. According to the United States Census Bureau, the town has a total area of 13.3 sq mi (34.4 km2), of which, 13.1 sq mi (33.8 km2) is land and the balance is water. Great Blue Hill in the Blue Hills Reservation is the highest point in Norfolk County. The summit houses the Blue Hill Observatory, home of the longest continuous weather record in North America, along with multiple radio transmitters. There are no official wards or neighborhoods defined in the town's governance and community planning processes. Although geopolitical lines do not form neighborhoods in Milton, there are many distinct neighborhoods, such as the Columbine Cliffs, Indian Cliffs, Scot's Woods, Milton Village among others. Milton is often cited as being the windiest city in the United States, with an annual average wind speed of 15.4 mph (24.8 km/h) measured at the Blue Hill Meteorological Observatory. As of the census of 2010, there were 27,002 people, 9,274 households, and 6,835 families residing in the town. The racial makeup of the town was 77.4% White, 14.3% Black or African American, 0.1% Native American, 4.1% Asian, 0.0% Pacific Islander, 0.6% from other races, and 2.5% from two or more races. Hispanic or Latino of any race were 3.3% of the population. As of the census of 2000, the population density was 1,999.1 people per square mile (771.7/km²). There were 9,161 housing units at an average density of 702.7 per square mile (271.2/km²). The top six ancestries of Milton are Irish (38.0%), Italian (11.3%), English (8.6%), West Indian (4.8%), and German (4.7%). There were 8,982 households out of which 37.5% had children under the age of 18 living with them, 60.1% were married couples living together, 11.9% had a female householder with no husband present, and 24.8% were non-families. 21.2% of all households were made up of individuals and 12.7% had someone living alone who was 65 years of age or older. The average household size was 2.79 and the average family size was 3.27. In the town, the population was spread out with 25.8% under the age of 18, 8.0% from 18 to 24, 25.9% from 25 to 44, 24.1% from 45 to 64, and 16.2% who were 65 years of age or older. The median age was 39 years. For every 100 females, there were 89.7 males. For every 100 females age 18 and over, there were 84.2 males. According to a 2010 estimate, the median income for a household in the town was $103,373, and the median income for a family was $131,025. Males had a median income of $85,748 versus $61,500 for females. The per capita income for the town was $47,589. About 1.6% of families and 2.8% of the population were below the poverty line, including 2.2% of those under age 18 and 4.5% of those age 65 or over. There are six public schools in Milton, including four elementary schools: Collicot, Cunningham, Glover, and Tucker; one middle school, Charles S. Pierce; and the Milton High School. There are also private schools, high schools and elementary/middle schools, including the girls' school Fontbonne Academy, St. Mary of the Hills, St. Agatha's, Thacher Montessori School, Carriage House Schools, and Delphi Academy. Milton is also home to the prep school Milton Academy, and Curry College, a small liberal arts institution. Milton is also one of the few school systems to offer a French immersion program, starting in Grade 1. For those students that participate in this program, all classes are taught in French during grades 1 and 2, allowing children to become fluent in this language. In grades 3 - 5, some classes are taught in English as well to prepare for the MCAS. This program continues through grade 12. Spanish/English is taught as well. In the middle school Latin is available for the Spanish/English students. Milton lies within the Massachusetts Bay Transportation Authority district. Fixed-route service includes the Ashmont-Mattapan High Speed Line, a light rail extension of the Red Line. Milton has 4 stops: Milton, Central Avenue, Valley Road, and Capen Street. This was originally a steam railway prior to becoming a trolley line. Massachusetts Route 28 and Massachusetts Route 138 run north and south across Milton, and Interstate 93, which is also U.S. Route 1 and Massachusetts Route 3, loops around the town near the southern and eastern borders. Cycling is a popular form of transportation and recreation in Milton. The opening of the Neponset River Greenway reconnected Milton with Boston Harbor via Port Norfolk, Dorchester. Other cycling routes and locations include Turner's Pond, Brook Road, Blue Hills Parkway, Milton Cemetery, and the Pine Tree Brook greenway. The Milton Yacht Club began in 1902, with a small building in the Lower Mills area beside the Neponset River that was formerly the police department for the town of Milton. Various boats continue to be anchored there or stored on the dock during the winter. ^ a b "Population and Housing Occupancy Status: 2010 - State -- County Subdivision, 2010 Census Redistricting Data (Public Law 94-171) Summary File". U.S. Census Bureau. Retrieved 2011-06-26. ^ "Blue Hill Meteorological Observatory 1891-2010 Means and Extremes". Blue Hill Meteorological Observatory. 7 May 2013. Retrieved 19 December 2016. ^ "Blue Hill Observatory daily sunshine data". Blue Hill Meteorological Observatory. Retrieved 11 October 2015. ^ Caleb Daniloff, "Rock from Axl to Zep", BU Today, October 21, 2008. ^ Marquard, Bryan (2010-06-22). "John Ferruggio, at 84; hero of 1970 Pan Am hijacking". Boston Globe. Retrieved 2010-06-27. ^ Holoman, D. Kern (2012). Charles Munch. Oxford University Press. ISBN 9780199912575. The History of Milton, Mass., 1640–1887 by Albert Kendall Teele, published 1886, 688 pages. Milton Records: Births, Marriages and Deaths, 1662–1843. Published 1900. Dutton, E.P. Chart of Boston Harbor and Massachusetts Bay with Map of Adjacent Country. Published 1867. A good map of roads and rail lines around Milton including the Granite Railroad. Old USGS Maps of Milton area. 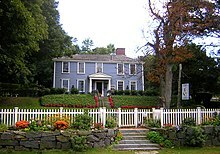 Wikivoyage has a travel guide for Milton (Massachusetts). 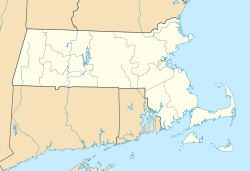 Wikimedia Commons has media related to Milton, Massachusetts. "Milton (Massachusetts)" . New International Encyclopedia. 1905. "Milton (Massachusetts)" . Encyclopædia Britannica (11th ed.). 1911. This page was last edited on 10 March 2019, at 04:15 (UTC).